Snakes are considered to be one of the most dangerous species. But the fact is those very few kinds of them are dangerous because most of them are nonvenomous. This is the reason why people consider snakes as a pet in a few western countries. Depending on geo-location, they are of various sizes, shapes, and colours. Few snakes are so beautiful that you will not stop staring for hours. In this post, I am listing 10 most beautiful snakes on earth. Green Tree Python is a beautiful snake primary resides on trees. Very occasionally it can be seen on the ground. It is found in near rainforest and colour of the snake helps it to hide in the tree branches. The average length of this snake is 1.8 meters. Green tree pythons have a unique way of resting on branches. They will go round and round in coils and rest their head in the middle. Green tree pythons love to eat small mammals and reptiles and while hunting they sit on a branch and waits for its prey, once he passes, they attack very quickly. The beautiful snake species is native to north Queensland and on a few islands of Indonesia. The species were seen as very common and not considered in danger of extinction. 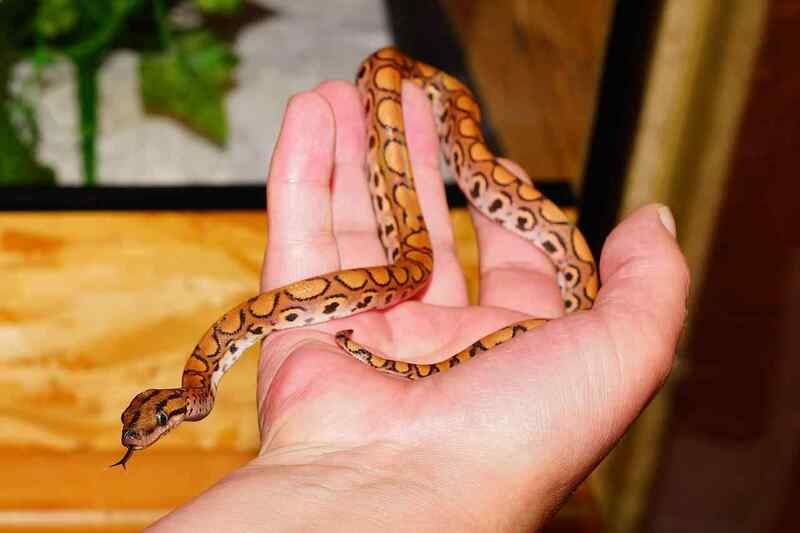 One of the most popular snake species among reptile collectors and hence they are kept as exotic pets. According to the herpetoculture hobby, the snake species is also known as “chondros” because of the classification in the genus Chondropython. However, they are very often kept in captivity under special care conditions. The species reproduction has never been reported in wild but according to the most prominent information on their reproduction comes hobbyists in the pet trade. Blue racer snake can be seen throughout the US but mostly in the eastern regions of the Rocky Mountains. They are very intolerant of humans so they prefer to live in regions with the less human population. They are also known as eastern racers. They prefer open or semi-open habitats that include hedgerows and meadows. Also, their habitat can occupy an area extending up to 25 acres but maximum can be seen together. Talking about the appearance, the head is darker than the body and eyes are also relatively larger in size. The scales on the body are brownish-orange in colour. The snake is a good climber so it was often seen at 20 to 30 feet above the ground. They love to survive in sunny and dry habitats and most seen in open woodlands, shrubby fencerows, stone walls, hedgerows and old farmlands. Also, they are known to inhabit old dunes and sand prairies. The snake species breeds during the spring that is from April continuing throughout May. The female species lay eggs anywhere upto 5 up to 28 eggs oval eggs that are 2.5 cm to 3.9 cm long and have leather shells. The hatchlings used their “egg tooth” to cut their way out. The hatching will take place from mid-August to late September and the young species measured around 8 to 11 inches (20 to 30 cm) in length. They are considered to be relatives of the cobra, mamba, and sea snake. Eastern Coral Snake mostly saw in sandy and marshy areas of southeastern United States. They love to spend their lives inside the underground hole or leaf piles. Also, Eastern Coral Snake can grow up to 2 feet (0.6 meters) in total length. The most unique feature of eastern coral Snake is their bright coloured patterned bodies fixed fangs and potent venom. The species are relatives of the cobra, mamba, and sea snake. They love to stay underground or in leaf piles. The snake eats frogs, lizards, smaller snakes and even sometimes other coral snakes. The average life of the species is undetermined, however, they live up to seven years in captivity. The species are relatives of the cobra, mamba, and sea snake and mostly seen in wooded, sandy, and marshy areas of the southeastern United States but spend most of the time in the burrowed underground or in leaf piles. There will be no no pain or swelling at the point where it bites. The baby snake emerge from the eggs 7 inches long and fully venomous. Brazilian Rainbow Boas snakes can be found in the length of 5-7 feet long. These are found in various colours typically range from deep red to bright orange. On the base colour, it has bold crescent moons of contrast colours. The beautiful snake species found in the Amazon basin of Brazil, French Guiana, Southern Venezuela, French Guiana, coastal Guyana and Suriname. It is considered as a medium size snake species with 4 to 6 feet in length and weighs approximately 2 or 3 lbs. The snake species have soft and beautiful iridescent skin and hence the name. It requires high humid temperature and hence difficult to keep it in captivity. The lifespan of Brazilian Rainbow Boa is estimated to be 10 years, however, in captivity, the snake species can grow up to 30 years. You must also know about apex predators in the world. The species usually preyed upon the birds of prey, small mammals and other reptiles. It is an ovoviviparous species that means hatching will develop in egg sacks inside the female’s body and later they hatch inside and born alive. The breeding season occurs from November to January with an average clutch ranging from 12 to 25 hatchlings. The gestation period lasts about 5 months. These are often found near water but sometimes you will find these on trees. Talking about the appearance, It has a beautifully patterned skin and known for its rapid growth. One of the largest snakes in the world can grow up to 7 meters and weighs up to 90 kilograms. The young amelanistic Burmese Python love to its spend its time on trees, however, when they are matured their size makes it difficult for tree climbing or even impossible and hence they enjoy ground life. You can also read about the most dangerous amazon rainforest animals in the world. It is also commonly known as two-lined black Shieldtail. It is mostly found in the Western Ghats of southern India. The maximum knowledge about this beautiful snake was only through specimens. It was described by the specimen obtained from Richard Henry Beddome. He has given a description of this species in the summit of the Periya peak in Wayanad. One of the most colourful snakes in the world mostly seen in the mountains of India. It is also one of the world’s lesser-known species whose body back and the belly is beautifully separated by the yellow stripe. The Emerald tree boa is a non-venomous snake. It is mostly seen in Venezuela, Colombia, subspecies Bolivia, Peru and northwestern parts of Brazil. These species are unique subspecies have been found by a scientist. It is considered one of the most beautiful snakes in the world. They love to live in tropical rainforests areas and wetlands. The snake species can be grown up to 2 meters in length. Talking about the appearance, It has a large head approximately flat and whole is somewhat triangular in shape. The young one has some different colour which is usually red-brown, orange or yellow. The lifespan of the snake is estimated to be around 20 years when in captivity, however, the average age is around 15 years in the wild. These are not very large and typically found in the length up to 6 feet. Typically this species can be found in yellow or tan colours with brown to olive-green. One of the most beautiful snakes which also comes under non-venomous snakes in the world. The snake species is additionally known as “chicken snake” because it loves eating chickens and eggs. It comes under subspecies of the rat snake and it is mostly harmless to humans. The species is native to the United States, particularly in Texas, however, its range extends to Louisiana, Arkansas, and Oklahoma as well. One of the most beautiful snakes comes in various colours and the first time it has been seen in New Braunfels, Texas. It comes in two colouration variations known as tangerine phase and the tricoloured. The base colour of the species is red along with distinct rings or bands of black and yellow. The lifespan of the Honduran milk snake is estimated to be around 15 years while in captivity. Their predators include birds of prey, wild felids and humans. One of the largest snakes in the world, Indigo Eastern Rat Snake also is known as the blue indigo snake is one of the beautiful snakes on Earth. It is a non-venomous colubrid snake. They are mostly seen in the Eastern United States. These are shiny bluish-black coloured snakes known for their use of gopher tortoise burrows. They use it either for nesting or as a winter den. The snake species have various inhabit like dry glades, stream bottoms, xeric sand ridges, cane fields and higher ground with drained sandy soils. Talking about the appearance, they have a smooth scaled body and shiny bluish-black belly. The longest known Indigo eastern rat Snake is native to the United States that have ranged from 60 to 84 inches and can weigh up to 5Kg. It mostly flattens its head when threatened or attacked by predators. These are the 10 most beautiful snakes on Earth. Do post your comments.